This weekend I finally was able to add the final touch on my living room decoration. 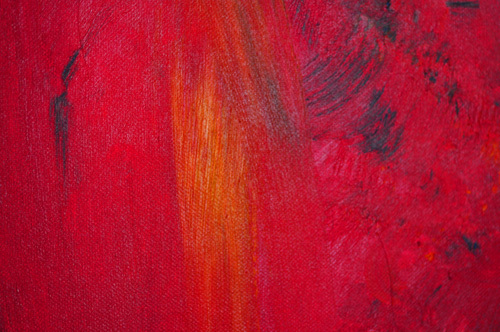 The painting shown above, “Crimson,” is the first art work I’ve commissioned someone else to do. I have to say I’m very pleased with it. We moved in the new house last summer. The living room was the first room we decorated. When it comes to interior decorating, my style is minimalistic and functional. I’m a big fan of clean lines and simplistic shapes found in Mid-Century Modern furniture. 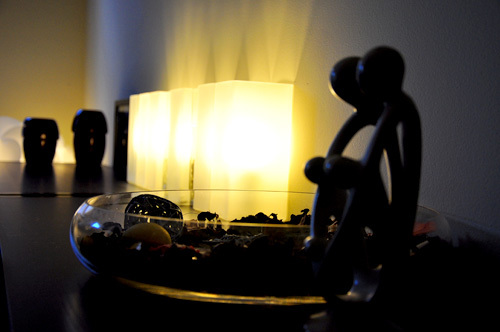 But I also like to offset main furniture with more organic accessories so the room doesn’t come off as boxy or sterile. I’m very keen on balance. Straight needs to be offset by curves; dark should be accessorized with light; calming should be accompanied by a little chaos, etc. Overall I’ve been pleased with how the room turned out. However I always felt that something was missing. It took me a while to realize the colors in the room are a bit boring. 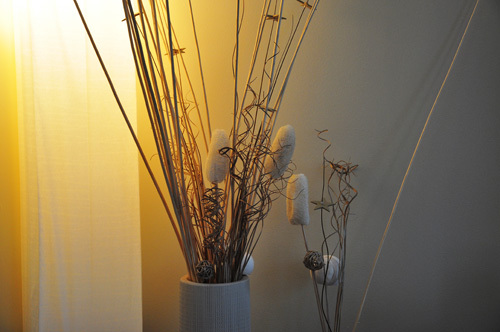 The main color palette in the room is comprised of beige, white and dark brown. 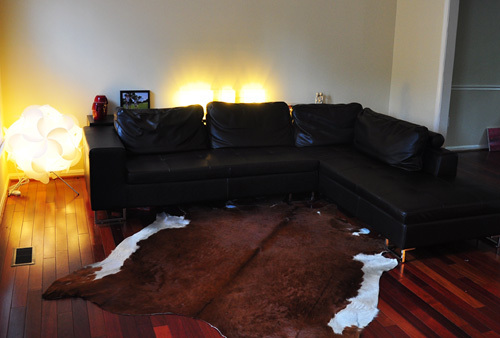 The last accessory I added to the room was the cowhide rug, to give the room more contrast in terms of color, texture and shape. But I don’t think it did quite enough. Recently, I’ve been on the look out for a piece of wall art that stands out, but without disturbing the overall theme of them room. Connor is a young aspiring artist I’ve known for a while. 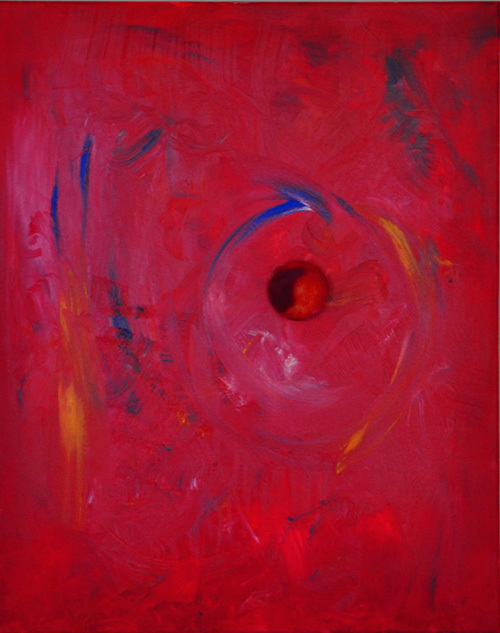 I enjoyed looking at some of his past work, which were mostly abstract paintings full of raw emotions. I showed him my living room, and told him where I’d eventually hang the painting. I asked him to come up with something. I purposely did not tell him what I wanted the painting to look like or resemble. Quite honestly, I didn’t have a clear picture in mind. I provided him with the art supplies. I picked oil paint because I definitely wanted the piece to have more texture. When I first saw the painting as he finished it, I was rather startled. The the amount of vibrancy in this painting wasn’t what I expected. I stood there for about thirty minutes to slowly digest the painting as a whole, then in parts. Abstract Expressionism to me, is not just about the artist’s own expression, but also about viewer’s own interpretation as well. This painting definitely has some Franz Kline influence. Once I hung the painting up on the living room wall, it became apparent to me that Connor definitely had the room in mind while he was painting. 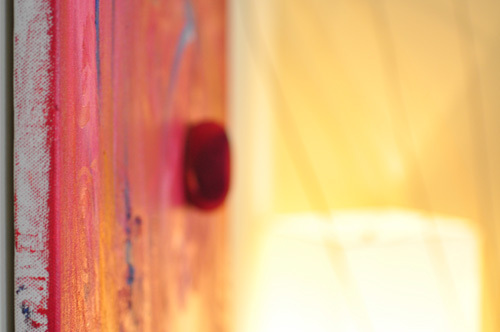 Crimson, by itself is overwhelming, but when it became a part of the room, it complimented every element. 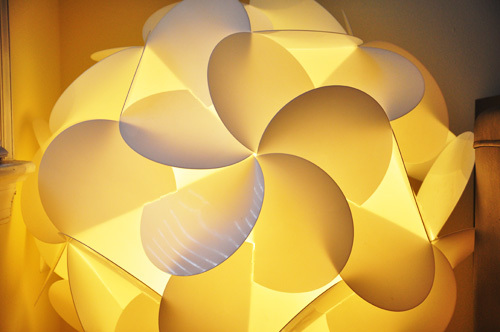 It brought chaos to the calmness by its color, form and irregularity. However, it does not over power what was established before. 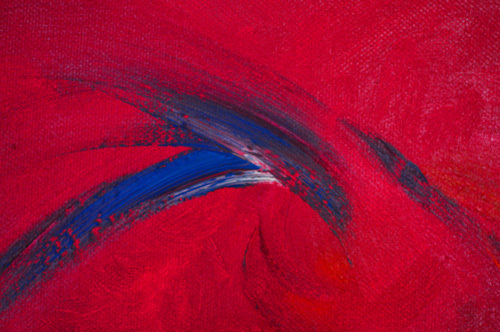 The the brush strokes around the accent colors at first appear random, but upon closer look, the strokes around it conform to the motion. It feels there’s a calm within the chaos. This happens everywhere on the canvas. If I were to frame the painting to smaller rectangles, I could see a repeating pattern: chaos vs. orderly. 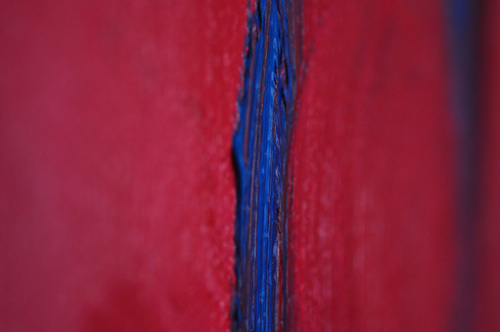 The subtle use of blue streaks not only breaks out of the red, but also stands out in texture. The sponge left on the canvas was the first thing I noticed. I’m sure it was left there intentionally. I wondered why. 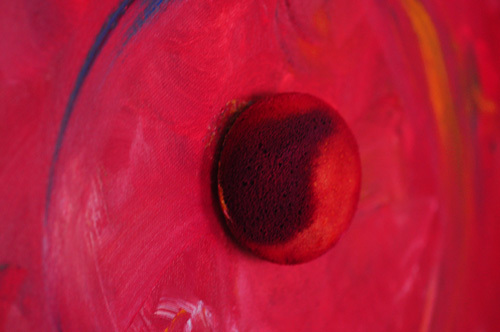 Then I realized its circular shape is a perfect balance to the square shape of the canvas. 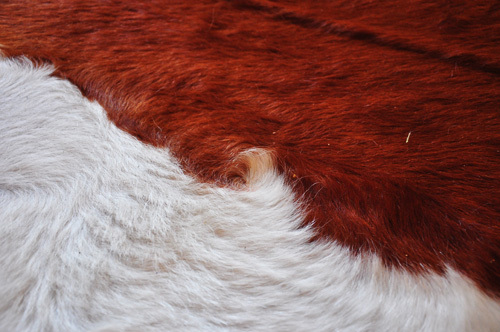 Also, its contrast in color resembles a Yin Yang symbol, subtly. The bleeding of the edge on the canvas could be due to carelessness, but I think it’s a perfect contrast to the overwhelming “neatness” of the room. I’m pleased with this new painting. I’m sure I’ll find new meanings in it everytime I look at it some more. Connor, my two year old son, working hard. Most excellent – that had better be non-lead-based paint! How much for the rights to his next work? awesome. You have a beautiful living room and the painting really is fantastic. 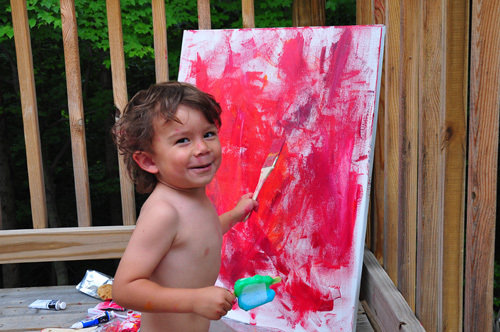 I can’t wait until my son is old enough to use a paint brush. 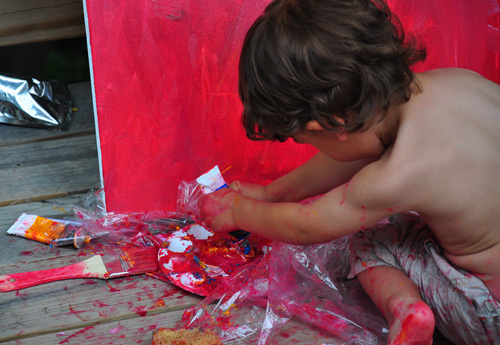 I am already seeing the artist within him working its way out, and he’s only 1. @Kris, Thanks. I think early childhood education is important. 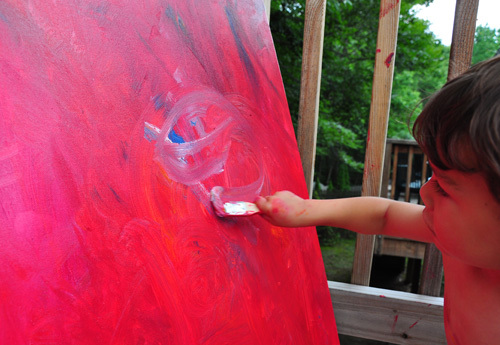 At a young age, art is definitely a good one to start with. I chose Connor to do the painting because I feel he’s the purest. My other two boys are older, so I don’t think they’d come up with something that’s as uninfluenced. As I was reading my article, already knowing you had a 2 year old son named Connor, I still found myself somehow fooled into believing that it was just a coincidence that your artist was named the same. That combined with knowing you went out shopping for art supplies this weekend. It wasn’t until I scrolled down enough to see it was actually Connor your kid, that I was convinced. You have out done yourself with this one! ROFL I cracked up reading this. Connor did a fantastic job! It looks great in your living room. Nice comedic timing — not knowing your son’s name made me a sucker right til the end. :-) And it looks great! Maybe you should start him with and etsy page and see if you can sell some more online. It would be hilarious if you set an artist’s bio and then revealed at a later date that people were buying the artwork of an infant. Great post. Just proof that it’s all about how you spin it. My god, this entry was great. You have very similar tastes as me when it comes to furniture. Love the photos and the surprise ending. And I totally saw the yin-yang in the sponge at first glance! Wow…what a great story. 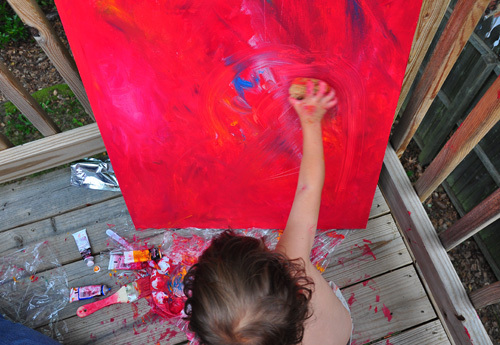 Creativity expressed through art at a young age is amazing. And I think it is an awesome experience for your child to see his work hanging up some prominently at home. Thanks for sharing, and I like the space you have created! @Jeff, thanks. I remember seeing photos of your living room on your blog, and I thought we had similar taste too! Nice work, there’s a future in there somewhere I’m sure… and it will always be priceless. I have to say that I do love your living room – and the painting. I’ll admit I nearly laughed out immediately – definitely some great spin on it. We used to have our fridge decorated in paintings by my nephews/nieces… right now, though, the walls are fairly plain with paintings that came with the apartment. You fooled me. I thought you paid someone a few thousand dollars for that painting. This post made me smile tremendously once you mentioned your son was the artist. @Steven, thanks! I hope he’ll be a creative type later. He seems to be interested in art more than my other kids. @Stef, he demands high quality popsicles! @Laura, funny you mentioned it… remember I said “my kid can do this” when we went to Hirshhorn? I let him do just that..
@Kim, I love the innocence in the crafts kids create. They just seem so pure and unpretentious to me. @Aaron, you should totally do this with your girls! It was a great weekend afternoon activity for the whole family. High quality popsicles, now that I can afford. LOVE IT!! So clever, father and the son! Jin… The piece is beautiful. And even more so when you see the artist. It is true that art comes from so many places. Amazing post per usual. Loved that you left the artist profile to the end!! So beautiful and job well done. kid is an artist already! I have similar taste of you on decoration. I really appreciate your kiddie’s painting and your LCD. Great post. I genuinely wasn’t expecting that ending! 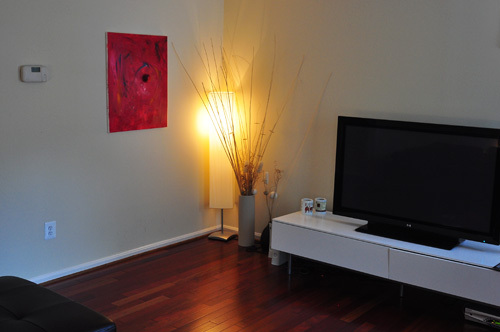 Your living room looks really well thought out, and the art finishes it off nicely. I’m with all of the others who were taken by surprise! I loved it though. I did have to laugh at myself with how serious I was taking the interpretation only to find out that this fabulous painting was done by a toddler. I didnt scroll down at all while reading so the ending was such a surprise. Love it lots. wow! I really thought you have commissioned an expensive artist,and when I saw the artist I was delighted. Good to have a great artist at home. I never comment but this time I just could not stop. 2 Popsicle for the little artist.